The role of teaching and learning is actually reversed in the thinking of the world. The reversal is characteristic. It seems as if the teacher and the learner are separated, the teacher giving something to the learner rather than to himself. Further, the act of teaching is regarded as a special activity, in which one engages only a relatively small proportion of one’s time. The course, on the other hand, emphasizes that to teach is to learn, so that teacher and learner are the same. It also emphasizes that teaching is a constant process; it goes on every moment of the day, and continues into sleeping thoughts as well. To teach is to demonstrate. There are only two thought systems, and you demonstrate that you believe one or the other is true all the time. From your demonstration others learn, and so do you. The question is not whether you will teach, for in that there is no choice. The purpose of the course might be said to provide you with a means of choosing what you want to teach on the basis of what you want to learn. You cannot give to someone else, but only to yourself, and this you learn through teaching. Teaching is but a call to witnesses to attest to what you believe. It is a method of conversion. This is not done by words alone. Any situation must be to you a chance to teach others what you are, and what they are to you. No more than that, but also never less. The curriculum you set up is therefore determined exclusively by what you think you are, and what you believe the relationship of others is to you. In the formal teaching situation, these questions may be totally unrelated to what you think you are teaching. Yet it is impossible not to use the content of any situation on behalf of what you really teach, and therefore really learn. To this the verbal content of your teaching is quite irrelevant. It may coincide with it, or it may not. It is the teaching underlying what you say that teaches you. Teaching but reinforces what you believe about yourself. Its fundamental purpose is to diminish self-doubt. This does not mean that the self you are trying to protect is real. But it does mean that the self you think is real is what you teach. This is inevitable. There is no escape from it. How could it be otherwise? Everyone who follows the world’s curriculum, and everyone here does follow it until he changes his mind, teaches solely to convince himself that he is what he is not. Herein is the purpose of the world. What else, then, would its curriculum be? Into this hopeless and closed learning situation, which teaches nothing but despair and death, God sends His teachers. And as they teach His lessons of joy and hope, their learning finally becomes complete. Except for God’s teachers there would be little hope of salvation, for the world of sin would seem forever real. The self-deceiving must deceive, for they must teach deception. And what else is hell? 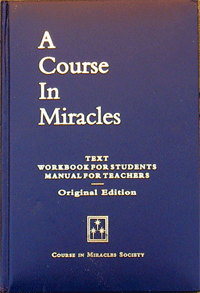 This is a manual for the teachers of God. They are not perfect, or they would not be here. Yet it is their mission to become perfect here, and so they teach perfection over and over, in many, many ways, until they have learned it. And then they are seen no more, although their thoughts remain a source of strength and truth forever. Who are they? How are they chosen? What do they do? How can they work out their own salvation and the salvation of the world? This manual attempts to answer these questions.